To book a private class, session or dinner with Kaaren, or for help with organising a Champagne Club for you and your friends, please click here. Select the language on the page at the top right hand side. Australia’s Champagne Bureau sponsors educational masterclasses and tastings, future sessions with be included in NEWS & EVENTS. The Champagne Bureau also offers a short on-line course. Please click here to see the details. In Brisbane, Australia, try Bernadette O’Shea. Bernadette can also be found at the Emporium Hotel Champagne Club on the first Tuesday of every month, when she offers her insights into five different champagnes. Champagne education clubs are a great source of learning. Most clubs are private, such as the 12-member South Australian Springfield Champagne Club, which has been meeting for over ten years, or the much newer Adelaide Champagne Club. There’s also a Sydney Champagne Club, which meets monthly. The ED Cellars Champagne Club, Mitcham, South Australia, kicks off 15 February. For details, please contact Margot by clicking here. If you’re visiting Champagne, Essi Avellan’s Guide is the best resource. Her tasting comments are also excellent, and I rarely disagree with her. Available from Amazon, and other places. If you want a rating for current releases, try Tyson Stelzer’s bi-annual Champagne Guide. The Tasting Room is another excellent resource with tastings by many knowledgeable palates. Best of all, it’s free, so click here to register. 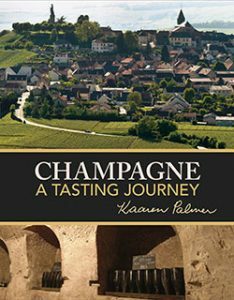 For general, and deeply detailed study for beginner through to winemaker, plus palate training, there is no better book than Champagne A Tasting Journey which can be ordered on this site. Peter Liem’s Champagne, The Essential Guide to the Wines, Producers and Terroirs of the Iconic Region is at its strongest when Liem talks about particular growers and Houses, although there is usually less than a page written per producer. The book is a hard-bound and handsome item, and it’s possible also to buy the deluxe version, thereby investing in a set of reproductions of the wonderful old Larmat maps of Champagne. Another reputedly great work, which I have just opened, is Gert Crum’s Champagne, The Future Uncorked. It looks very promising. The official site of The Champagne Bureau. Jancis Robinson’s great Purple Pages service gives the subscriber all the latest news of wines from around the world, and that includes, of course, champagne. Please click here. Journalist Peter Liem publishes a good on-line subscription guide specialising in Champagne. Although it’s difficult for a one-man-band to keep abreast of everything, he’s worth a try. Find Michael Edwards, Tom Stevenson and others on Tom Cannavan’s Wine Pages …read more. Ed McCarthy and others write for the Wine Review On-line. To see some interesting itineraries from Michael Edwards and Tom Stevenson, please click here. Alder Yarrow is one of the internet’s most respected opinions on wine. Please click here to search and find some of his thoughts on champagne. Michel Jolyot’s love of Champagne clearly shows in his photography. Please click here. Richard (I-am-the-number-one-champagne-person-in-the-world) Juhlin’s site is also subscription only. If you’d like to know more, please click here. The well-credentialled scholar and gentleman, Tim Hall, at Scala School of Wine in the UK, knows a lot about champagne, both place and drink. He is one of the UK Champagne Ambassadors, and continues to write about his passion, as well as judging champagne in wine shows. To find his free site, please click here. His site is well worth a long trawl. If you want to find the Champagne Houses’ websites in one place, please click here. Touring Champagne, please click here. To discover walking maps of Champagne, please click here. If you want to spend hours finding further useful info about Champagne from Chateau Loisel, please click here. ‘Biologic’ champagne interests can be assuaged. Please click here but, on entering the site, please select U.K. English at the top right hand of the page, or you’ll find yourself practising your French. Champagne Journal’s trailer on YouTube teases you to watch all twelve sessions. Please click on each topic below to open it. Jancis Robinson is a great communicator about champagne, and a very good teacher. Her presentations, such as this on YouTube are numerous. The knowledgeable Jiles Halling is really more than a blogger. Food, yes, but what about food and champagne pairings? Please click here. For the love of champagne, some of us devote a lot of time and energy. Sara Underdown declares here love. Mention should be made of the esteemed Giles Fallowfield. Palate Press’s contributors include authors Becky Sue Epstein and Caroline Henry (who, in particular, know a lot about growers’ champagnes and has written a passionate book about the topic). The delightful Belinda Aucott writes and draws about champagne themes. Many wine bloggers include the fine wine of Champagne on their sites. Please click here for one such example. Lastly, before all the info from the Galaxy Guides website is updated and migrated to this website, you’ll still find a lot of worthwhile champagne information there. Email any queries you might have to Kaaren Palmer. Wine magazines such as The World of Fine Wines, Fine Wine Magazine, Decanter, Wine Spectator, Wine Enthusiast and Gourmet Traveller Wine feature the wines of Champagne, especially when the celebratory season of Christmas and New Year approaches.